When I was a teenager, I always dreamed about releasing a music album and starring in a music video featuring one of my songs. To me, the visual element was a perfect fit for the music and MTV really revolutionized the whole music industry. Back then in the 90s, it was a privilege of the signed acts, who were supported by major labels. Video production was capital intensive and took many professionals to complete. Luckily, times have changed dramatically since then. On the one hand, pro musicians are facing a tougher environment, where record selling has become much more challenging. On the other hand -thanks to the internet and new technologies- bands without a label contract are granted with countless opportunities to produce and promote their music also with limited budget. Your question: “How to make my own music video?” will be answered in 4 short steps, further explained in this post. Before you even think about the video production, you have to make sure, your song is recorded, mixed and mastered. Unless you have a high quality version of your music, it makes no sense to talk about making a music video. As well as with video production, today there is professional, still affordable hard-, and software available. With some willingness to learn something new, you can build your own home studio and create high quality music. There are numerous blogs about building a home studio. To keep it short, here’s what your minimum requirement should look like. That’s it. You can start right away with that. Sure, there are always additional gadgets to play around with, but your basic equipment will enable you to get pretty good results. I don’t want to go too much into detail, as this article isn’t about recording. Nevertheless, I will give you my personal experiences and recommendations. As I generally work with Apple, I use a MacBook Pro together with Logic Pro X as production software. If you’re more into Windows, you should go with Cubase or Pro Tools, both industry standards. Of course, there is also free recording software available, but if you are any serious about this, make a shortcut and get a professional program. There are amazing audio interfaces on the market at very low prices. I personally use a USB interface. As a singer, my emphasis lies on the vocal mic. I started with a cheaper one, but once I decided to purchase a Neumann, overall quality of the vocal tracks changed dramatically. You don’t have to start with such a high standard, as the Neumann isn’t low budget. But keep in mind to not underestimate the mikes, especially for your voice recordings. Once, you have built your first home studio and got acquainted with the recording and mixing process (which is a lifelong journey), you will soon have your first -at least semi-professional- track in place. Now, lets switch to making the video. To grab the most attention, you should always come up with an intriguing plot. Avoid merely seeing the band perform somewhere. That’s just boring. Start with a raw version of the story, e.g. a guy has an appointment with his girlfriend for a concert; he’s too late and has to run as fast as he can to make it on time; he eventually gets there. Done. As important as a storyboard is, keep it simple and don’t overload yourself with too detailed instruction. What’s necessary for a professional video production with multiple crew members, can become stagnant for a creative two heading team. A crucial element of a good music video are the shooting locations. Take some time to visit the locations beforehand and make some tests. One of the best shots I’ve done so far was on an empty market 5:30 a.m. in the morning in July. The light was amazing, the scenery was overwhelming and we couldn’t have arranged it more perfectly. Play around with camera perspectives and angles. There is a wide variety just as “Extreme Long Shot”, “Long Shot”, “Full Shot”, “Medium Long Shot”, “Cowboy Shot”, “Medium Close-up”, “Close-up”, “Extreme Close up” and “Choker”. For different angles you can choose between “Eye Level”, “High Angle”, “Low Angle”, “Tilt”, “Over-The-Shoulder” and “Bird’s Eye View”. Having a script in place should be handled like a guide track when recording. You know the intro, verse, chorus, solo and outro. But the actual creation can deviate from the original version. 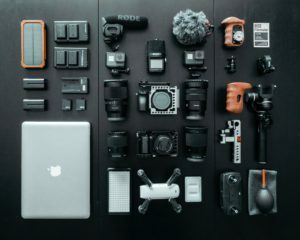 Although you don’t have to acquire a load of equipment, I recommend some basic essentials to guarantee a high quality of your video production. Basically, you start with a video camera. My first video was taken with a very old video camera. Soon I upgraded to a HD cam, which delivered brilliant results. The quality compared to the old camera was simply night and day. Another game changer was the purchase of a steady cam. It is an application that fixes the camera and makes the movement 100% smooth. This was the first video, that really had a professional touch. If you shoot indoor, you also have to consider using photography soft box lighting. The proper light is hugely important for high quality shooting, so I wouldn’t miss that one out. Also, you already can get a lighting kit for under $ 100.00. A tablet soon became inevitable to every shooting. We used it to play the song in the background to ensure proper lip syncing. Once you have the right set-up, shooting can begin. As already said before, keep an open mind to the magic of the moment. Shoot almost every scene from different perspectives and angles. That’s very important, when you find yourself in the cutting and editing process. You need to have as much material available as possible. Cutting has always been the most exhausting step in video production for me. There is to review every single shot and take out the best parts. There is to integrate it perfectly, so that it’s align with the vocals and passage in the text. When cutting, focus on keeping a natural flow and consistency with the music. Cut according to the timing of the song. As a rule of thumb: The more cuts you have, the more lively the video will unfold. I personally use Final Cut Pro for the production part. It’s a high quality software, that’s easy to use and delivers amazing results. Final Cut pro is packed with professional tools and plugins and makes video production real fun. When start shooting your first music videos, start as basic as possible. There are numerous options, you can add at a later stage and with more experience. Stay flexible and critical. Sometimes what looks cool in your head turns out to be shallow, once you actually start doing it in front of the camera. In my opinion location, lighting, storyboard and cutting are the parts you should put most emphasis on. Last but not least, on the day before shooting check if all of your equipment works and charge the batteries. I hope you find some useful information for your first music video in this article. Please, share your opinion and post your music video as I’m curious what you create. Thanks Felix for this information I don’t really know anything about shooting a video. But after reading this post I do now. This article can help out with any one wanting to shoot a video and just starting out. I biggest problem would be getting the right equipment because of the price. You need good equipment to get a good job done. Thanks Fred for reading and commenting! Hi Felix, thank you for a great article and step by step instructions on how to make a music video in 4 steps. I had some ideas but your article has clarified a lot of points in my head on how to proceed and the equipment I will need. I am so glad I found your site as it is full of very useful information… keep up the good work! Thank you Moni! Don’t hesitate, I will share all my knowledge with you. Thanks for the production software suggestions been out looking for those, lately. I really wanted to get one for my wife for her birthday. She’s been struggling with all kinds of free versions for ages now. Maybe right off the bat you have some suggestions for guitar recording mics? It will make for a no-brainer addition as she also plays an acoustic one that can’t be plugged. Anyhow, thank you for all the cool advice you gave. Will definitely keep that in mind once she decides that I need to help her to make a music video, haha! I am not in the music industry but found your explanation of how to make a music video pretty interesting. I would think a lot of your tips could also apply to making a video for any industry. Thanks for sharing! I will stay tuned, Greetings and all the best! This information is very useful information. Recording anything nowadays is so much more advanced than it was when I was growing up. You have given some sound advice and tips here. My daughter loves to sing and has even started trying to write a song. Your information will be very useful in helping her get it done correctly. Thank you for your help. Thank you Lee Ann for reading my article and commenting. I wish your daughter all the best. If she ever comes up with a question regarding singing, songwriting or anything alike, she can contact me anytime.